Editor’s note: This article appears in the Jan. 29 issue of ESPN The Magazine. the need to release competing biopics about a long-distance runner who finished fourth in the 1972 Olympics? One would have been plenty, right? The book world has just produced a similar head-scratcher: two competing biographies of Pete Maravich, one by acclaimed author Mark Kriegel, the other by Wayne Federman and Marshall Terrill, who spent five years putting their book together in collaboration with Pete’s widow, Jackie. On the surface, dueling Maravich books seems even stranger than dueling Prefontaine movies. After all, Pistol Pete died 19 years ago, didn’t win anything other than some scoring titles and never played in the Final Four — or past the second round of the NBA playoffs. His 10-year pro career spanned the depressing ’70s, a decade marred by drug and alcohol abuse, overpaid head cases, tape-delayed playoff games, violent fights and sagging attendance. We always hear that Bird and Magic saved the NBA. Doesn’t that mean they saved it from people like Pete Maravich? nobody knew what would happen next. The scoreboard never seemed to matter as much as the show. Kids from that era remember his appearances on CBS’s halftime H-O-R-S-E contests more fondly than any of his games. Even his basketball cards were cool, like the one from 1975, when he sported an extended goatee and looked like a count. So you can imagine my delight when Red Auerbach plucked an end-of-the-line Pistol off waivers during Larry Bird’s rookie season. We picked up The Pistol for nothing? Sadly, he was woefully gaunt and out of shape. Limping around on a bum knee and wearing a gawd-awful perm that made him look like Arnold Horshack, The Pistol struggled to blend in with his first good NBA team. The Garden crowd adopted him anyway. Every time he jumped off the bench to enter the game, we roared. Every time he sank a jumper, we went bonkers. When he shared the court with Bird, Dave Cowens and Tiny Archibald — that would be four of the 50 greatest ever — there was always a sense that something special could happen. But Maravich had picked up too many bad habits over the years. It was like the Celtics had adopted an abused dog from the pound — there was just too much damage. 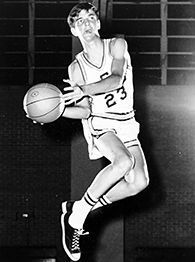 After our coach, Bill Fitch, buried him in the 1980 playoffs, The Pistol retired the following fall, missing out on suiting up for the 1981 champs. I remember being particularly crushed by the whole thing. I felt like I’d been given an expensive TV for free, and it had broken down after two months.